The Global Volcanism Program has no activity reports for Cerro Singüil. The Global Volcanism Program has no Weekly Reports available for Cerro Singüil. The Global Volcanism Program has no Bulletin Reports available for Cerro Singüil. 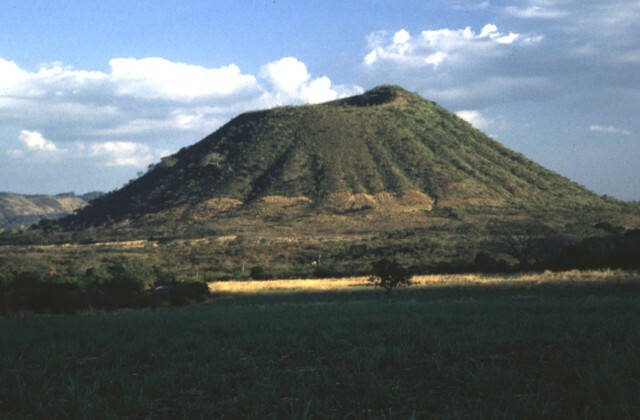 The most prominent feature of a volcanic field in the interior valley of El Salvador near the Guatemalan border SE of Volcán Chingo is Cerro Singüil. This scoria cone, also known as El Cerron, has a well-preserved summit crater and is part of a group of cinder cones and explosion craters mapped as Holocene in age by Weber and Wiesemann (1978). A young basaltic lava flow extends to the NNE down the valley of the Quebada La Presa, the headwaters of the Río Guajoyo. The volcanic field includes a line of three NNE-trending explosion craters N of the city of Chalchuapa, the highest of which is Cerro Tablas. The Global Volcanism Program is not aware of any Holocene eruptions from Cerro Singüil. If this volcano has had large eruptions (VEI >= 4) prior to 10,000 years ago, information might be found on the Cerro Singüil page in the LaMEVE (Large Magnitude Explosive Volcanic Eruptions) database, a part of the Volcano Global Risk Identification and Analysis Project (VOGRIPA). There is no Deformation History data available for Cerro Singüil. There is no Emissions History data available for Cerro Singüil. Bedded scoria deposits forming the flanks of a basaltic cinder cone are exposed in a quarry at Cerro Singüil. This cone is the largest of a small cluster of cones in El Salvador's interior valley SE of Volcán Chingo. These cones are part of a broad area of monogenetic basaltic volcanism near the Guatemalan border on the opposite side of the main volcanic front from the Middle-American trench. Cerro Singüil (also known as El Cerrón) is a large youthful-looking scoria cone with a well-preserved crater that lies at the eastern end of a large volcanic field in the interior valley of El Salvador near the Guatemalan border, SE of Volcán Chingo. 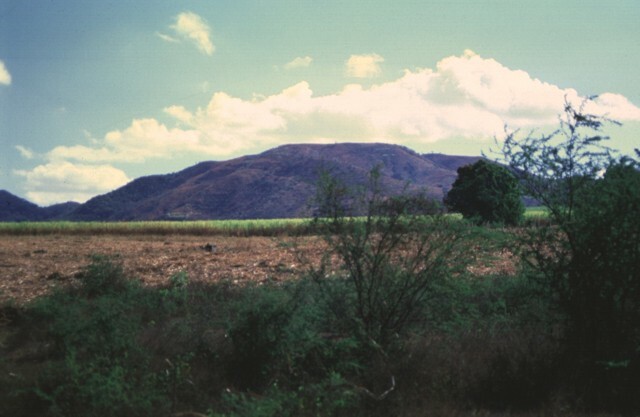 Cerro Singüil is seen here from the SE along the Pan-American highway, which skirts the eastern flank of the cone. 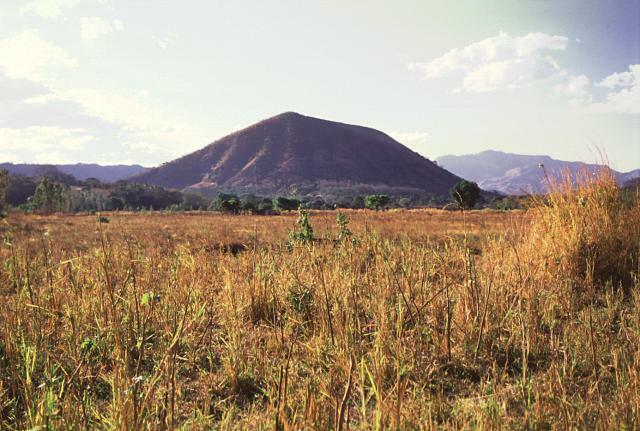 The flat-topped summit of Cerro las Tablas is cut by one of a chain of three N-S-trending explosion craters located west of Cerro Singüil in the interior valley of El Salvador. Cerro las Tablas at 1035 m is the highest peak of the Cerro Singüil volcanic field and is seen here from the west. 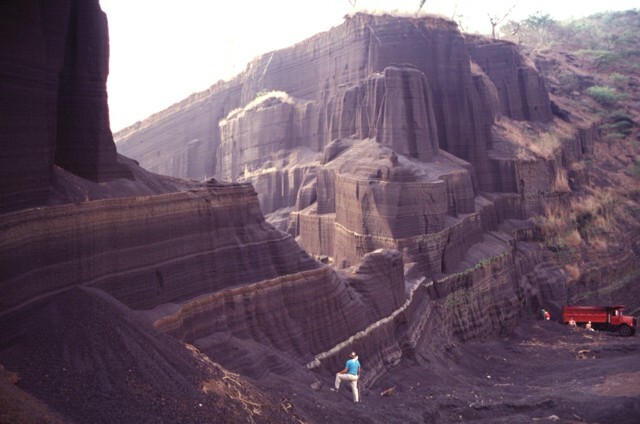 Cerro Singüil is a morphologically youthful cone that is nevertheless old enough for a series of radially oriented erosional gullies to have formed on its flanks. The 957-m-high cone rises 250 m above the floor of El Salvador's interior valley and is seen here from the NW, along the Pan-American highway. There are no samples for Cerro Singüil in the Smithsonian's NMNH Department of Mineral Sciences Rock and Ore collection. Large Eruptions of Cerro Singüil Information about large Quaternary eruptions (VEI >= 4) is cataloged in the Large Magnitude Explosive Volcanic Eruptions (LaMEVE) database of the Volcano Global Risk Identification and Analysis Project (VOGRIPA).